Become an Online Millionaire: New Online World Peace Lecture MP3 released! New Online World Peace Lecture MP3 released! Just posted a lecture on how to achieve world peace online through free self help books. I tried various combinations of things, but finally just wrote out an outline and gave it out-loud. Didn't take a lot of editing to get some of the mis-speakings out, but there is my online world peace MP3, all 47 minutes of it (more or less). The simplicity of it is that there appears to be a single underlying system to this universe - that we all subscribe to, regardless of our religious or political belief-systems. Bodies run the same, Nature will sprout seeds, the weather can be predicted (somewhat) - because they all operate on a common, base system. It doesn't matter whether you believe in an Islamic Allah, a Druidic or Wiccan set of gods, Huna amakua, or Christian-Protestant-Jewish God/Jehovah/Yahweh. Regardless of what god you pray to or how you pray, your body continues to function and you are being fed because some farmer somewhere grew your food for you - whether imported from across the globe or in someone's farm up the road. And that is the key point that my Go Thunk Yourself Self Help Library and personal development research has led me to. The Internet just makes it all possible. So I'm including here the press release on the subject. In a recent lecture, Dr. Robert C. Worstell has released findings that claim world peace is possible just through enough people reading free online self-help and personal development books. Through studies that resulted in his successful "Go Thunk Yourself!" book series, and his Personal Development Library of the same name, Dr. Worstell said that the route to world peace is completely mapped out - and has been for some time. He refers to continuing bestselling authors such as Napoleon Hill, Wallace Wattles, Charles F. Haanel, Earl Nightingale, as well as current bestselling DVD's, such as "The Secret" and "What the (Bleep) Do We Know?". In these books, tells Worstell, are the simple and recurring secret paths which lead to World Peace. "The joke is that they tend to remain secret, even though authors like Earl Nightingale have made Gold Records telling people about them - and DVD's like "The Secret" give it all away within a few minutes of watching their film. In fact, these secrets are in the New and Old Testament as well as most religious scriptures and are often quoted in sermons. The trick is in connecting the dots", says Dr. Worstell about his lecture. In that lecture, Dr. Worstell "connects the dots" in drawing upon sources such as quantum physicists, New Thought authors, popular personal development gurus, and the oldest-known philosophic system known on this planet. He also draws from current researchers into spiritual mysteries such as Gregg Braden to give examples of how his single system could result in solving world problems such as poverty, war, and housing shortages. "The term 'Secret' has been applied to so many of these books that it almost becomes an oxymoron in our Internet Age - especially since they are almost all available as free online downloads, or can be purchased for low cost. Your trick is to be able to put these data together and get them to work for you. Enough people using these data in open-handedly improving the world around them would result in a lasting world peace and global prosperity at a level never reached historically - or even approached. The term 'Golden Age' could be applicable." Apparently the limits to world peace lie in the fact that not enough people are reading, believing, and using the data available through these authors. Worstell gives no estimate as to the amount of people it would take to create this global phenomenon, only the theory of how it is possible. And to forward his theories, he has made his lecture available for free online download through his website and blogs. 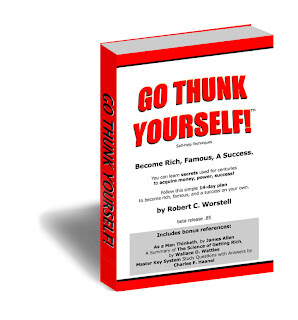 Dr. Worstell's "Go Thunk Yourself!" book series is published by online Print-On-Demand Publisher Lulu.com, with the title book also available on Amazon.com and other online booksellers. Dr. Worstell has written and published over three dozen personal development books, as well as numerous articles, and whitepapers. He has studied the human condition for over 35 years, working in counseling and consulting as well as freelance research. And I'm working on improving a PowerPoint I have on this particular lecture. Right now, it's all text and b-0-r-i-n-g. (Like any lecture.) However, with video, I can (and need to) add additional images in there to punch up that message and add additional nuance. Unfortunately, I can only get 10 minutes up on YouTube, so the rest will be linked here when I get the whole thing up on my site. But for now, enjoy the MP3!